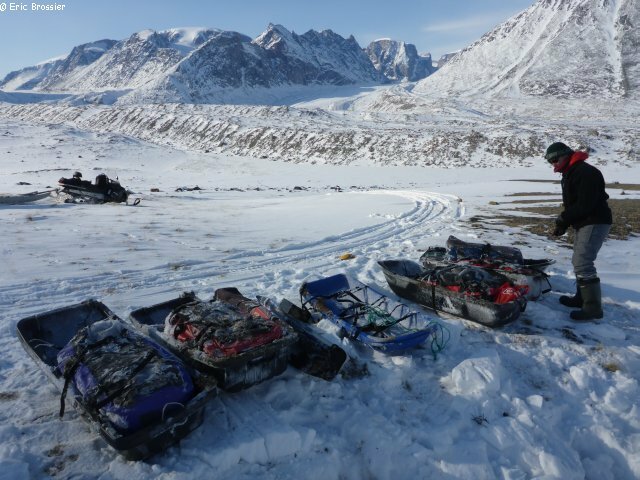 After receiving an email two days ago, we decided to organize the recovery of some hidden gear left behind in June, on the tundra in the middle of Auyuittuq Park. Seven skiers found themselves with no other option than walking when the snow had melted. They had to continue on foot, with large bags stowed in the back instead of sliding with skis and sleds (read also Blog June 17, 2014). This weekend is perfect: it is the last one before the GreenEdge high season (up to 20 people on site for 6 weeks), snow is still good and it's not too cold anymore! By Friday after school, our sleigh flies towards Tasialuit. Billy and Daisy are opening a little cabin for us, near other cabins, their own one, Raygelee and Silasie's cabin, and Ena and Sammy's cabin. Saturday, while our daughters are enjoying a beautiful day with all our friends, Billy is driving us by snowmobile in North Pangnirtung Fiord then to Akshayuk Pass. Only Inuits are allowed to drive in the park, so we sit in the bumpy sleigh. "We need about 8 hours for the return trip" said Billy. But he has to find its way between the rocks and land patches that already appear, or sometimes drive on the river's bare ice... Valley bristling with sumptuous peaks, spectacular Mount Asgard, then comes the ultimate "treasure hunt", thanks to our GPS: under 40cm of snow we finally find the seven sleds, skis and bags. It's 10pm when we meet Aurore and Léonie again. 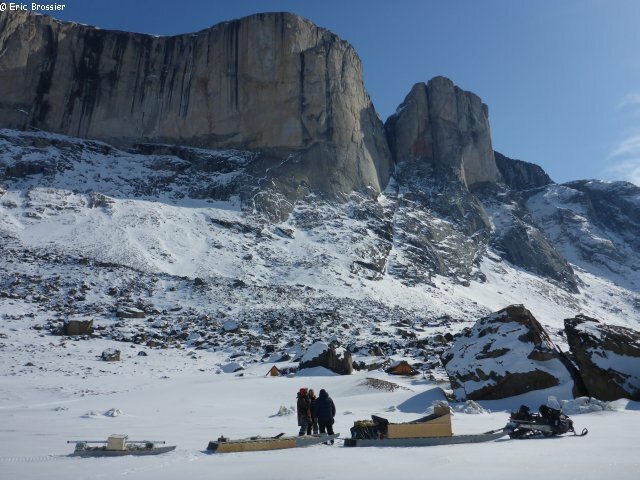 The next day, Sunday, at 6am, Eric is heading back to Qik, towing the icemeter (200 km measures this weekend), and then to the ice camp with the scientists. 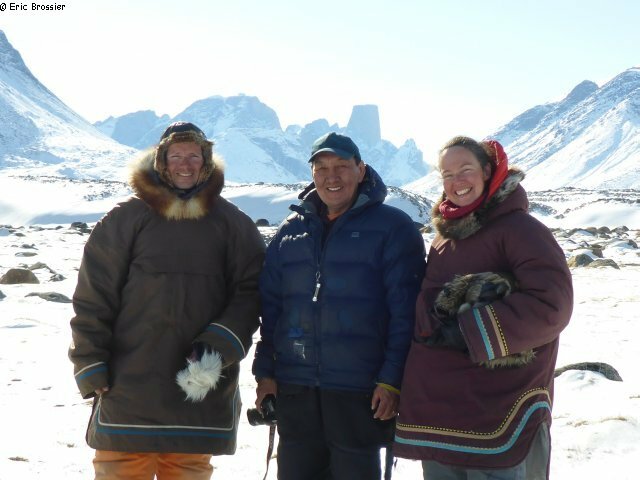 Aurore, Leonie and France enjoy another day in Tasialuit. The break was wonderful!